The original Karakal logo was a Lynx, but in 2002 the logo was changed. Starting with the Turkish translation of Karakal, meaning 'Black Ear', and the fact that KARAKAL has three 'A's, it was decided to use the outside pair as 'Black Ears' and exaggerate the centre 'A' with a dot below, which can be interpreted as a ball or shuttlecock. The new name logo and the 'A' ball give instantly recognisable brand marks that continue the Karakal ethos of quality and value for money that the original Karakal Lynx stood for. Karakal now have distributors in over 40 countries and still specialise in racket sports equipment. Name: Karakal meaning 'Black Ear' - derived from the Turkish translation. Habitat: Africa, Arabia, Southwest Asia, Turkey, India & Bristol. 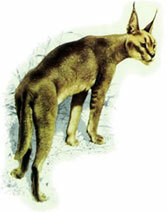 Related Species: Closest relatives are Bobcats and Lynx. Senses: Like most cats the Karakal has keen eyesight and very sensitive hearing. Colour: Varies according to the locality but is usually sandy to reddish brown above and white below. Fur is exceptionally dense to keep out extreme cold at night. Distinguishing Features: The Karakal's ear tufts serve as camouflage as they resemble the tips of grass, it sometimes lowers the ears as an aggressive signal.